A three Judge panel of the Appellate Division of the Superior Court found in a unanimous decision that the N.J. 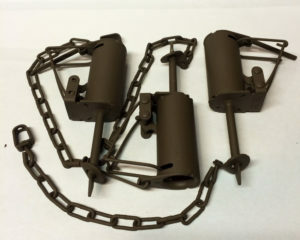 Fish and Game Council acted within its rights and the intent of the 1984 law that banned the steel jawed leg hold trap when it legalized the dog proof trap for use during the 2015/2016 trapping season. The court also ruled that the dog proof trap was not a steel jawed leg hold trap as defined in the 1984 law. The trap that was in question is “foot enclosing” and does not operate as jaws with only one movable side of the trap. New Jersey rabid raccoon attacks have been endangering public health for some time. These are just a few of the instances where the public was effected and endangered. · Boonton Township, Morris County Park, July 27, 2016. A 76-year-old Morris County man was attacked by a raccoon, park closed after attack. · A rabid raccoon attacks and mauls a six-year-old boy on his way to school in Elmwood Park, N.J. January, 28, 2016. · Police warning residents of Hasbrouck Heights, N.J. after Raccoon attacks. June 20, 2016. · A raccoon attacks terrifying neighbors in Denville. Despite an expanding raccoon population in New Jersey and the high rate of rabies found in that population, the New Jersey Assembly voted to ban the use of the encapsulated Dog Proof trap as a means of controlling raccoons. Subsequently this new trap was reviewed by the New Jersey Attorney General who found it to be a legal alternative to the steel jawed leg hold trap that was banned by statute in 1985 and the results from the first seasons use of this trap indicates an increase in the raccoon harvest and not a single reported case of a non-targeted species being captured. Two responses to the same problem. One is an attempt to manage wildlife while protecting public health the other is purely political and done to gain the votes of animal rights activists. As a resident of the State of New Jersey, what solution would you choose? The New Jersey Outdoor Alliance not only to opposed the proposed resolutions, ACR-25/SCR 11, but called for legislative remedy to reverse years of public exposure to, and the proliferation of reported cases of rabies epizootic caused by prior actions that eliminated trapping devices for population management. Prior legislation that eliminated trapping devices has put residents at risk for rabies. On October 1, 1985 a law went into effect that banned the use of leg hold traps. Prior to the law, the dog proof trap accounted for the harvest of over 40,000 raccoons per year. As a consequence of the ban of leg hold traps, harvest of the rabies vector species dropped precipitously towards zero. This created the perfect storm for the rapid spread of rabies throughout the entire state of New Jersey. Upon implementation of the leg hold ban New Jersey had not yet detected its first case of rabies carried by raccoons. Although detected in West Virginia, Delaware and Maryland, New Jersey remained free of the virus. The rabies epizootic spread into New Jersey through Warren and Hunterdon counties in 1989. This introduction took place concurrently with raccoon populations growing to historical levels and carried throughout New Jersey in three years. According to the New Jersey Department of Health, Division of Epidemiology, “all areas of the State of New Jersey, including urban centers, have been effected by the raccoon rabies epizootic. Suburban areas in which raccoons, people and pets are in close proximity have had the largest number of cases. From 1989 through 2015, 7,357 New Jersey animals were confirmed to have rabies. The rabies virus is now established in the raccoon population resulting in an average of about 280 animal cases annually. Raccoons account for 73 percent of the rabid terrestrial animals diagnosed.” This was according to the New Jersey Department of Health Rabies Background and Technical Information Report 2010. New Jersey Department of Health, Division of Epidemiology, Environmental and Occupational Health Infectious and Zoonotic Disease Program, New Jersey Animal Rabies Case by County and species Report January 1-December 31, 2015. There is clear evidence to consider that the banning of a proven effective tool for wildlife management has resulted in greatly increased risk of rabies to New Jersey residents. The NJOA strongly opposed ACR25/SCR11 as this legislation would have removed the only new device used for population management introduced since the 1985 ban on dog proof, leg hold traps went into effect and is useful for a targeted species. Additionally the NJOA recommended the immediate consideration of alternative types of traps that have been developed since 1984 for introduction in New Jersey. The use of effective trapping devices will provide for effective control of wildlife populations, the reduction of exposure to the rabies virus and an increase in public safety. The Superior Court decision is seen as a victory for not only the NJOA but especially for the trappers of New Jersey.